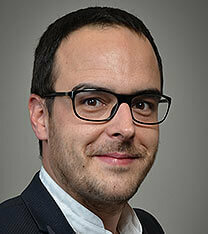 Graduated from IAE Lille (Ecole Universitaire de Management), Nicolas Schmitz, currently 37 years old, joined Optimedia France when he earned his Master Degree (DESS – Diplôme d’Etudes Supérieures Spécialisées) of International Communications and New Medias, in 2000. He contributed to the creation of the digital department of ZenithOptimedia as a Planner before becoming Deputy Director of Zed Digital in 2005 then Delegate Managing Director of Zenith France in 2008 and Deputy Managing Director in 2011. During this period Nicolas led major accounts like Nestlé, Lactalis, Fnac, BPCE or Toyota and managed 70 people. In April 2014, Nicolas was appointed Managing Director of VivaKi Exchange, counting 200 people, with the main role of optimizing the totality of the trading activity on every touchpoints, offline and online.